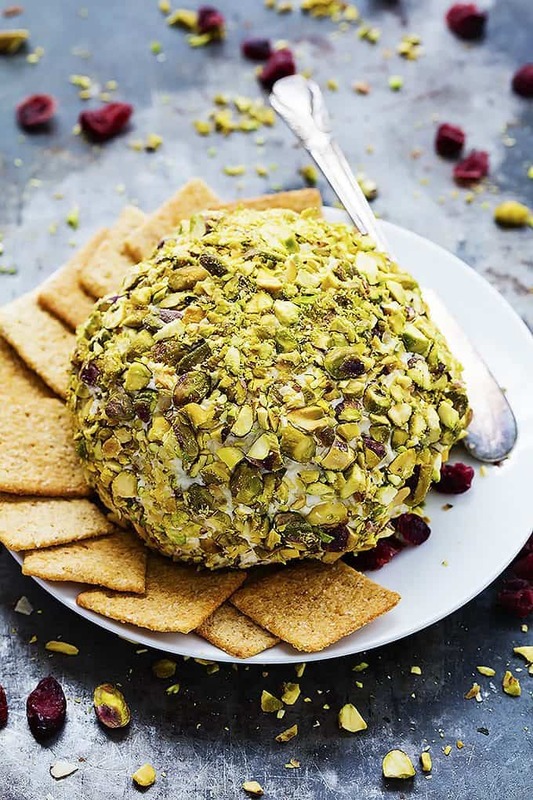 Cranberry Pistachio Cheeseball made from savory white cheddar cheese, cranberries, and pistachios- perfect for holiday parties! Thanksgiving is THIS WEEK. What the what??? I wouldn’t call myself a procrastinator. I’d say I’m more of overestimator. I tend to over estimate the amount of time I have and the number of things I can get done in said amount of time. Which is part of why holidays creep up on me and suddenly I think, how on earth did this happen? I had so much planned and I’ve only done x, y, and z. As for my Thanksgiving Day plans though, I am 100 percent ready. I know when and where I’m expected to make an appearance and I know exactly what I’ll be preparing and bringing in the way of yummy Thanksgiving eats. In addition to my ultra-popular candied pecan sweet potato casserole, famous slow cooker mashed potatoes, and newly perfected homemade pumpkin pie, I will be bringing this cranberry pistachio cheeseball for three reasons. SO easy to make. Like… so easy. DE-licious. Savory and sharp and tangy and woah. So tasty. If your Thanksgiving is anything like mine it involves multiple houses and groups of people and some car time. So whatever I’m making has to be portable or it’ll end up a hot mess in the back of my Mazda. That, and it’ll be an embarrassing site one we arrive at our destination. That’s why a good cheeseball is my go-to for a portable Thanksgiving side dish. Everybody loves a good cheese all and this one is perfection. 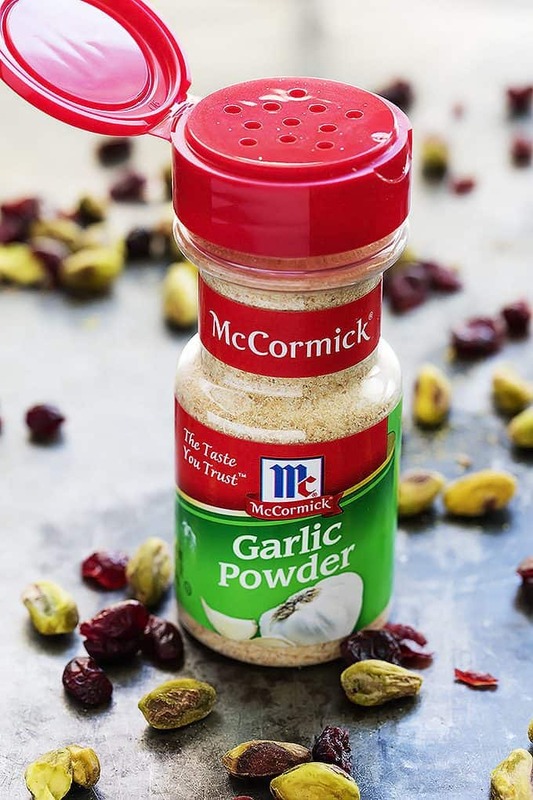 Salty, nutty pistachios, sharp white cheddar cheese, a hint of dijon mustard and McCormick Garlic Powder, and tangy, tart cranberries. Pair it up with your favorite crackers and set it on a pretty plate for a side dish that’ll impress the whole crowd! 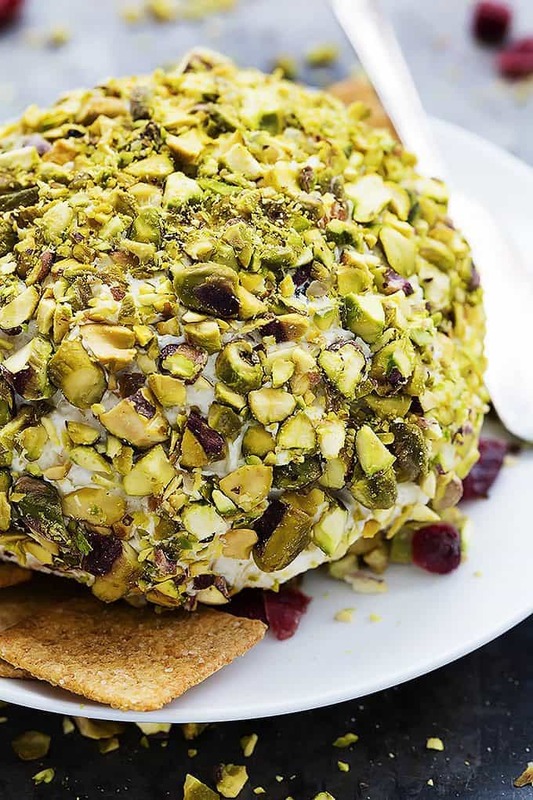 Savory white cheddar, cranberry, and pistachio cheeseball - perfect for holiday parties! In a large bowl mix together cream cheese, white cheddar cheese, dijon mustard, and garlic powder until well combined. Mix in chopped cranberries. 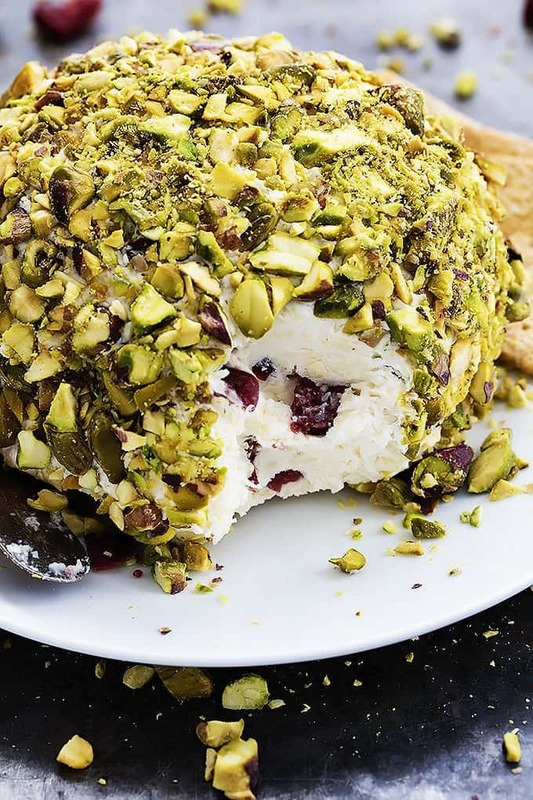 Unwrap the cheese ball and using small handfuls of nuts at a time, press the chopped pistachios onto the outer surface of the cheeseball. (You don't need to cover the bottom of the cheeseball with nuts). Place on a plate and serve with crackers, or cover and chill until ready to serve. Try these other Appetizer Recipes you'll love! I know, I cant’t believe Thanksgiving is this week – craziness! This cheese ball is gorgeous though, and look so tasty! Such an awesome, festive holiday appetizer! Gimme, gimme! Thanks Roxana! If it has cheese, I’m THERE!! These bites must be a melt in your mouth experience! 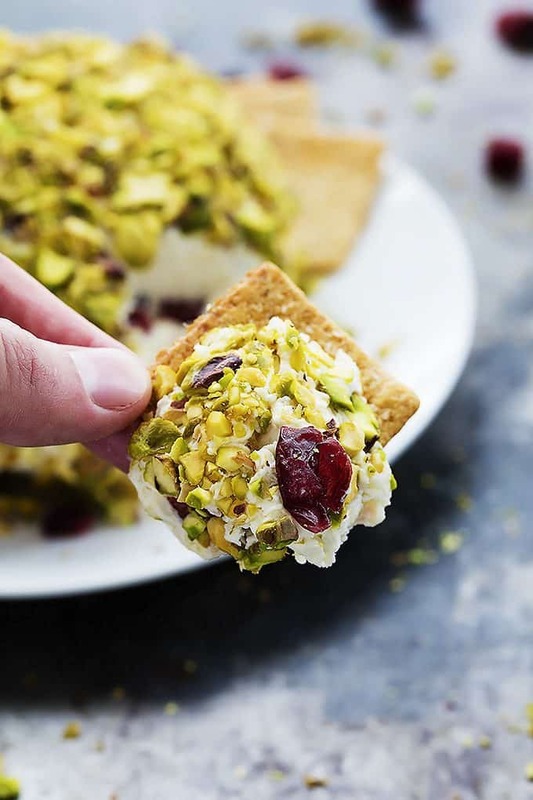 Love all those crunchy pistachios and the cranberries go so well with the cheese. Nice recipe! 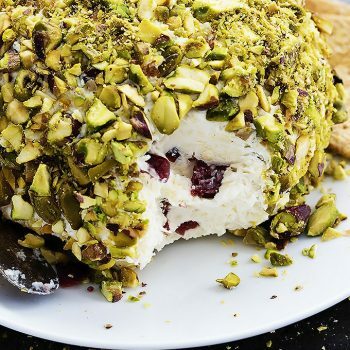 This cranberry cheeseball looks totally delish! I wonder how it would be with fresh cranberries. I love anything with cranberries, especially fresh ones! This cheeseball was so delicious. Had it as an appetizer for thanksgiving and everyone loves it! Every year my friends have a wine and cheese party before Christmas. I’ve now made this twice, and both time it was a roaring success. This will definitely stay in my repetoire! I am so happy to hear that!! You just can’t go wrong with cranberry and pistachio!! Could you substitute fresh cranberry sauce for dried cranberries? Albeit, being a thick sauce. This looks and sounds so wonderful! Can you use a very thick cranberry sauce instead of dried cranberries? Any help would be appreciated. Hi Angela- I haven’t tried that before so I can’t say for sure. You could try spreading it in a shallow dish and serving as a soft dip instead of shaping into a ball if you wanted to do it that way?